To educate the American public and reach underserved communities through innovative financial education solutions that bring about personal awareness and encourage positive financial behaviors over the long-term. CFEF is a non-profit 501(c)(3) national financial literacy foundation based in Washington, DC. Founded in 2007 by executives in the financial services industry. CFEF’s founders recognized the growing divide between the availability of consumer credit and the lack of financial education around these credit products, and more importantly, consumers’ understanding of their own financial situation. We are experts in the field of consumer and financial education. We develop programs for organizations that inform, engage, motivate, and empower consumers. We seek to improve the financial health and capability of each individual who participates in our programs and expand the financial well-being of the communities we serve. Our approach is to provide free financial education workshops and resources across the spectrum of personal finance topics to reach underserved community groups in need across America to help put them back on track to financial responsibility. We promote this initiative as “MyStartingPoint”. We believe that technology must be part of the financial education equation to make these initiatives easily deployable, effective and measurable. 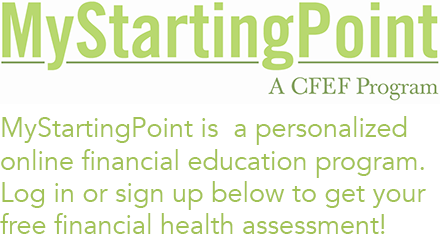 MyStartingPoint is our proprietary web based application that transforms financial education from a nice to have to a must have. MyStartingPoint transforms how our partners engage with their customers, prospective customers and the broader community. Empowering consumers by generating increased awareness of their own financial situation and providing the tools they need to improve. Building capacity among community organizations, academic organizations and government agencies that benefit from providing or enhancing consumer financial education. Providing thought leadership in the financial education communities to help eradicate the growing problem of financial illiteracy in communities across America. Promoting a clear understanding to policy-makers, community leaders, and participating companies of the need for financial education and community development programs. CFEF combats financial illiteracy by providing innovative outcome based financial education programs with an adaptive learning model. We are a trusted financial education foundation providing a technology solution that empowers individuals and communities to achieve financial stability and independence.